Evie the Extraordinary and Her Mommy: The Journey As We Go: Feisty is my middle name. Along with growing taller, Evie is growing in feistiness. She has definite opinions about everything from socks to books to how she should eat. 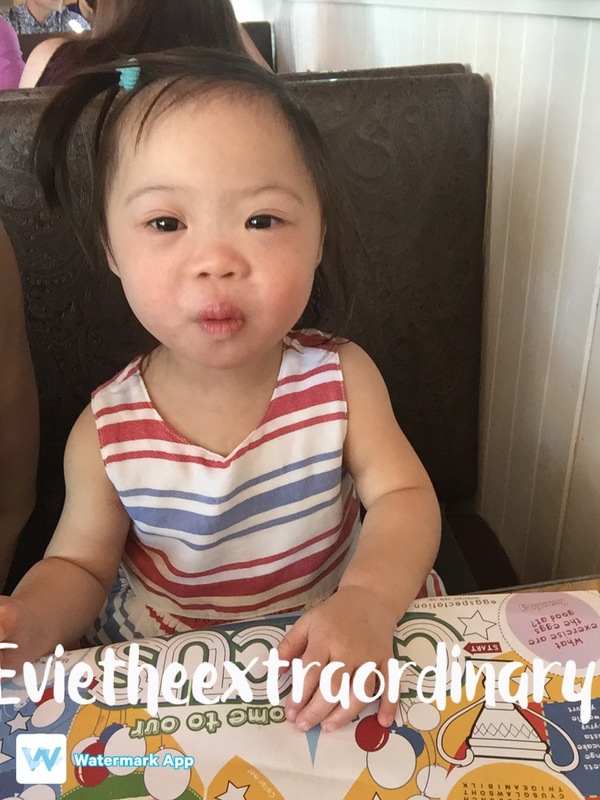 I didn't read on any of the Down Syndrome websites that there seems to be a theme of stubbornness in our kids (although every kid is still different!). But as I've learned from other families, stubbornness is a very real thing. First, she has the genes for stubbornness from both sides of the family. Then she seems to have the extra copy of special stubbornness. But the thing is, she's a cute stubborn. She sticks out her lower lip and crosses her arms as she emits a "Gaaaah!" Which just makes me laugh at her. Most of the time. Today I am not laughing. We decided last night to wean her off the iPad while she eats. I was inspired by the other parents on the tube-weaning Facebook group I joined, and while I was warned that it would be tough, it is still hard to start the journey. The first 2 meals were surprisingly fine. She ate 3 out of her usual 4 ounces. My voice was hoarse after singing every song I could think of, but I was pleased. Towards the end, I had to use the audio on my iPhone and let her listen to some music, because I just couldn't sing anymore. But it still worked. Enter Meal #3 sans iPad. I want to grab her and stuff the spoon in her mouth, but I know that would be horribly counterproductive in so many ways. So we are taking a break. For the 3rd time. If we were in a cowboy movie, we would be having a standoff, and Evie would be calmly reading a book while pointing her pistol at me, while I look intensely at her and wave a spoon at her face. She would at times yell "Gahhh" and then go back to her book. We've gone out and enjoyed the nice weather, gotten the mail, and tried again. Gahhh! Nope. The feeding therapist says to be consistent and mean what I say. She offered to take the iPad home and give it back to me when she's done with her maternity leave in September. She was serious. I guess she knows how hard this is going to be. But we got gushing approval today for making that decision. If it were just the iPad that was a problem, I would throw all caution to the wind. But the other side of it is that there's a GI doctor and a Nutritionist sitting in rocking chairs in the cowboy movie, watching the standoff, and telling me that she'd better not lose weight. "Stay on the growth curve," they drawl, as the tumbleweed rolls by. A black crow caws, mocking me. I stand my ground, throwing them a dirty look. And then I worry that she is losing weight when we worked so hard to get back on the growth curve. "Hey," I say, while she is only in the 3rd percentile on the typical growth chart, let me remind you that she is in the 50th percentile on the Down Syndrome chart. I'm not starving my kid! They stop rocking as they digest, and then they say their same mantra, "Just make sure she doesn't lose weight." So we're weaning off the iPad and weaning off overnight formula feeds with her feeding tube at the same time. Stroke of genius or suckers for punishment? Time will tell. Pray for us. 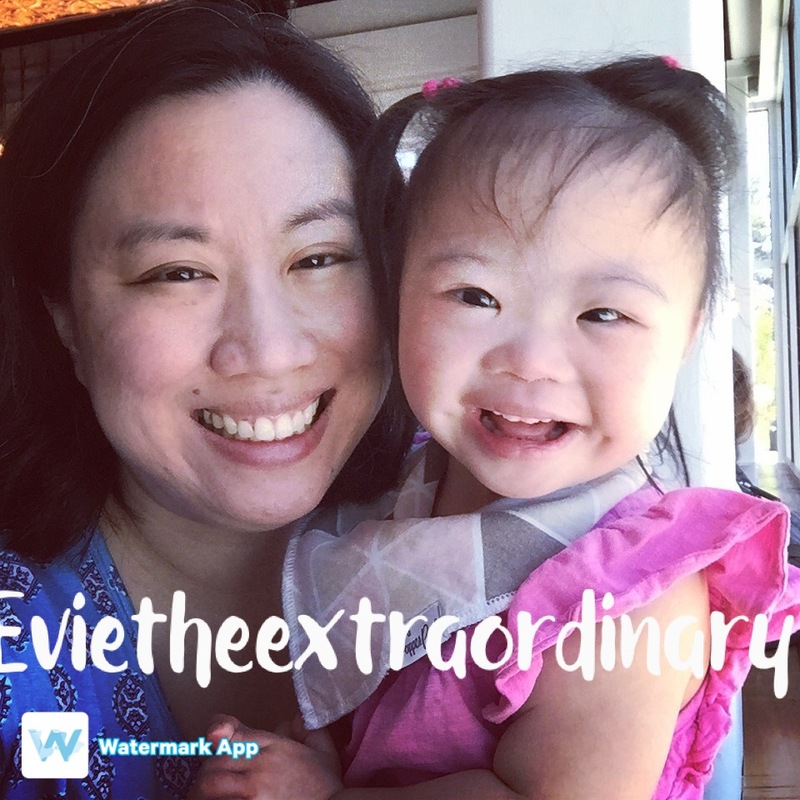 Evie's just fine--it's her parents who may go insane for the next few weeks. Update: 1 week in, and the score is Evie: 1, Parents: 0. She lasted a week with eating 1/3 less than usual, and we decided that weight loss at this point was counterproductive. So we are starting with no iPad and then using the audio, and then using the screen if we need to. With an average of 1.5 oz OFF the iPad, we have recovered now to 4.5 oz ON the iPad. The difference is huge. For now, we will concentrate on beefing her up and will try again once we get her off nighttime feeding tube formula. Amy, great writing and a heart-warming story. Thank you for sharing. Evie is adorable! Thanks so much for reading, Marie! Oh my goodness Evie! Thanks for the update, I hope you surrender your stubbornness soon!